The Bali House - Ibiza Villas 2000 - The best value villas in Ibiza! 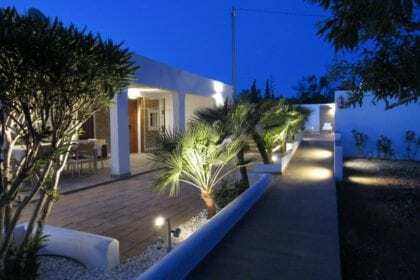 This Ibiza Town / Playa den Bossa villa comfortably sleeps 6 guests. The Bali House is a very unusual property in a wonderful location overlooking Ibiza Town and Playa D’en Bossa. The Bali House is very private and designed in the style of a typical Balinese villa. It’s only a 10-minute walk to the local shops and supermarkets and a quick 4-minute taxi ride into Ibiza Town & Playa D’en Bossa. 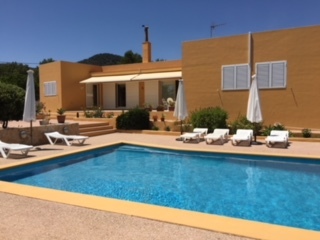 This great value Ibiza villa is perfect for small groups or families. You enter the house from the road into an open plan modern dining room/kitchen/living room that leads directly to the outside tropical garden area. The modern kitchen has all the latest amenities and the living room has a comfortable living area with plenty of sofas and chairs. To the left is a large double bedroom that overlooks the pool. To the right is another large double bedroom that overlooks the Balinese garden, plus a modern family bathroom, shower room & toilet. The Bali House is the perfect Ibiza villa rental for small groups or families looking to be close to the action yet enjoy absolute privacy in beautiful surroundings. The outside area is beautiful and very private. There is a wonderful “Al Fresco” dining area that overlooks a pool with a stone walkway across the shallow end. This leads to a very private studio that acts as the third bedroom. The studio has two single beds and its own ensuite shower. A perfect area for those who want privacy or for children looking for their own space. The villa has air-con and wi-fi throughout. The tropical garden is very well kept and blends in very well with the living areas. There is also a BBQ and a staircase leading to a wonderful chill-out area with spectacular views across Playa D’en Bossa and out to Formentera. The Bali House is a unique Ibiza villa in the perfect location with easy access to many beaches and all the action of Ibiza Town and Playa D’en Bossa. The studio is reached via a stone walkway across the pool. It offers 2 twin rooms and a large shower area.